Jesus was followed by crowds of people who wanted to hear him speak and see his healing miracles. This was the setting for the miracle of the loaves and fishes, where Jesus fed some five thousand people. This story is part of the build-up to the Transfiguration. Few people realize it was a dangerous time for Jesus. John the Baptist, another prophet, had just been killed by Herod Antipas; Jesus himself had been rejected by the people of Nazareth; and the Pharisees were intensifying their disputes with him. Soon, Jesus would confound the disciples by predicting his own death – something they did not expect at all. The incident of the loaves and fishes probably took place somewhere near Bethsaida, at the head of the Lake of Galilee. 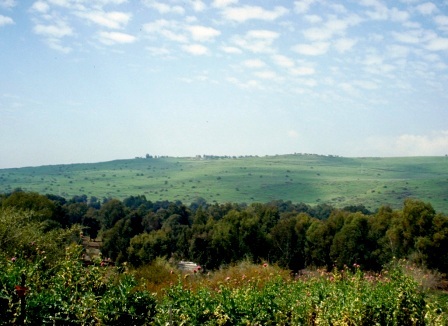 This town was the home of Peter, Andrew and Philip, and was Jesus’ destination after the miracle occurred. The feeding of the five thousand must have happened in its vicinity. Jesus wanted to get away from the crowds, so he could pray and think. His teaching and healing were a tremendous physical drain on him and he needed time to recuperate, but it was a constant battle to find privacy. There was another reason why he wanted to escape them: the crowds made him an object of suspicion to the authorities. If Herod Antipas had executed John the Baptist, he might well do the same to Jesus. 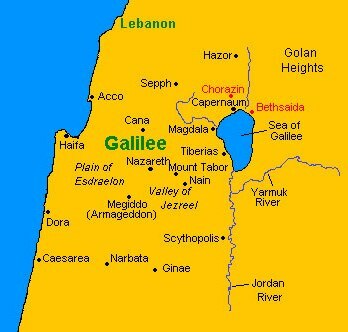 Galilee was notorious for sedition, and Jesus was very much a Galilean, not a Jerusalemite. Suspicion of rebellion was enough to sentence a man to death, and the crowds that Jesus attracted might, as far as Herod Antipas knew, be looking for a leader. These were dangerous times, and the authorities would naturally wonder why crowds were gathering in an isolated place. What could it mean but a planned rebellion? 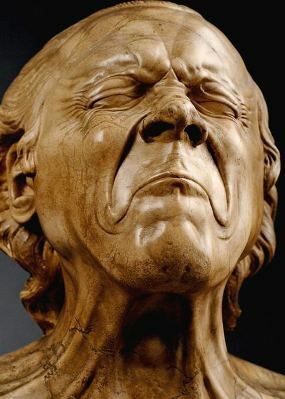 To make matters worse, it was somewhere near Passover – we know this because the gospel writers make a point of mentioning that the grass was green and luxuriant. The Messiah was expected to appear at Passover. So Jesus was wary; he did not want to be killed just because crowds followed him and the authorities saw him as a political danger. But even when he withdrew to a remote place, the crowds followed. He healed them and taught them, and they refused to leave. On this particular day, dusk was approaching. The people, and probably the disciples as well, were hungry and needed food. The disciples were inclined to look at the problem from a practical point of view. They themselves could not feed all these people. They barely had enough for themselves. Even if they could find supplies of food in this remote place, it would be impossibly expensive – at least two hundred denarii, when one denarius was a day’s wage. Jesus saw the situation and had compassion on this motley crowd: they were like ‘sheep without a shepherd’. He looked at what they had: five loaves of bread, probably barley bread, the normal food of working people, and two fish – smoked or pickled, as fresh fish would not keep in the warm weather. Then he ordered the disciples to organise the crowd into manageable groups, about fifty to one hundred people in each, so as to avoid confusion. What Jesus did seemed so simple: he took the bread and the fish and blessed and broke it, which was the normal thing to do at a Jewish meal. The Jewish prayer before eating was: Blessed are you, O Lord our God, King of the world, who brings forth bread from the earth. Jesus probably said the same words at the Last Supper. He now told the disciples to feed the people, which they did. Astonishingly, there was more than enough to go around. 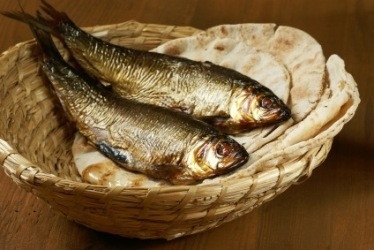 Like the Creator, Jesus had the power to multiply bread and fish. The gospel writer John draws a parallel with the feeding of the Hebrew tribes with manna in the desert. How this miracle happened, we do not know. Did the food increase as Jesus handed it to the disciples, or did it increase as they distributed it? Is there a rational explanation for the miracle? Were the people inspired to share what they already had? Were there far fewer than five thousand? Arguments rage. But if there were an explanation for this event, why was this miracle described in detail by all four gospels, so that it became such a central story of Jesus’ ministry? Unlike the other gospels, John’s gospel sounds an ominous note. 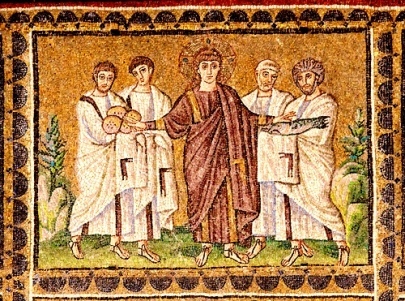 John notes that the people who witnessed the miracle suggested Jesus was the prophet mentioned in Deuteronomy 18:15, and they wished to proclaim him king. No doubt they were well-meaning radicals, but their words placed Jesus in great danger, giving leverage for his enemies. There was nothing he could do but try to escape by withdrawing to the mountains. 4. Epilogue. Read the red text. 13 Now when Jesus heard this, he withdrew from there in a boat to a lonely place apart. But when the crowds heard it, they followed him on foot from the towns. 14 As he went ashore he saw a great throng; and he had compassion on them, and healed their sick. 18 And he said, “Bring them here to me.” 19 Then he ordered the crowds to sit down on the grass; and taking the five loaves and the two fish he looked up to heaven, and blessed, and broke and gave the loaves to the disciples, and the disciples gave them to the crowds. 20 And they all ate and were satisfied. And they took up twelve baskets full of the broken pieces left over. 21 And those who ate were about five thousand men, besides women and children. 31 And he said to them, “Come away by yourselves to a lonely place, and rest a while.” For many were coming and going, and they had no leisure even to eat. 32 And they went away in the boat to a lonely place by themselves. 33 Now many saw them going, and knew them, and they ran there on foot from all the towns, and got there ahead of them. 34 As he went ashore he saw a great throng, and he had compassion on them, because they were like sheep without a shepherd; and he began to teach them many things. 39 Then he commanded them all to sit down by companies upon the green grass. 40 So they sat down in groups, by hundreds and by fifties. 41 And taking the five loaves and the two fish he looked up to heaven, and blessed, and broke the loaves, and gave them to the disciples to set before the people; and he divided the two fish among them all. 42 And they all ate and were satisfied. 43 And they took up twelve baskets full of broken pieces and of the fish. 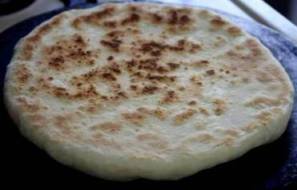 44 And those who ate the loaves were five thousand men. 10 On their return the apostles told him what they had done. And he took them and withdrew apart to a city called Beth-sa’ida. 11 When the crowds learned it, they followed him; and he welcomed them and spoke to them of the kingdom of God, and cured those who had need of healing. 12 Now the day began to wear away; and the twelve came and said to him, “Send the crowd away, to go into the villages and country round about, to lodge and get provisions; for we are here in a lonely place.” 13 But he said to them, “You give them something to eat.” They said, “We have no more than five loaves and two fish–unless we are to go and buy food for all these people.” 14 For there were about five thousand men. And he said to his disciples, “Make them sit down in companies, about fifty each.” 15 And they did so, and made them all sit down. 16 And taking the five loaves and the two fish he looked up to heaven, and blessed and broke them, and gave them to the disciples to set before the crowd. 17 And all ate and were satisfied. And they took up what was left over, twelve baskets of broken pieces. 10 Jesus said, “Make the people sit down.” Now there was much grass in the place; so the men sat down, in number about five thousand. 11 Jesus then took the loaves, and when he had given thanks, he distributed them to those who were seated; so also the fish, as much as they wanted. 12 And when they had eaten their fill, he told his disciples, “Gather up the fragments left over, that nothing may be lost.” 13 So they gathered them up and filled twelve baskets with fragments from the five barley loaves, left by those who had eaten. 14 When the people saw the sign which he had done, they said, “This is indeed the prophet who is to come into the world!” 15 Perceiving then that they were about to come and take him by force to make him king, Jesus withdrew again to the mountain by himself.